Laptop Powers On With No Video Display? If the video display does not appear on the monitor either, your laptop is most likely having a problem with it's motherboard. Did your computer just die, but you can't afford to get a new one or get your old one repaired? If you need to save money on a computer, take a look at our used computers on sale for less than $200! When your computer is frozen, do you unplug it from the wall because you can't shut windows down and you don't see any other way to turn your computer off? Next time that happens, try holding the power button down for 5 to 10 seconds. That should power off your computer! Need Help Buying A Laptop? Want A Free Alternative To Microsoft Office? Contrary to popular belief, defragging your computer and clearing your cookies usually do not make a noticeable difference in your computer's speed. If your computer has gotten slower over time, it's most likely due to a build up of spyware, viruses and programs running in the background that don't need to be. 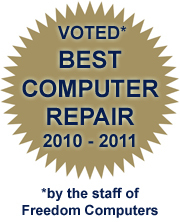 One service call from Freedom Computers is all it takes to get your computer running the way it should! Don't put up with a slow computer any longer! 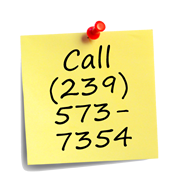 Call 239-573-7354! Does Your Mouse Arrow Jump Around During Use? Is your mouse arrow jumping all over the screen? If you're using an optical (laser) mouse, try using a solid color mouse pad with no pictures on it. Optical mice need a solid color surface in order to work properly. Otherwise, the laser can bounce back and forth between the colors. Don't forget to clean out the inside of your computer on a regular basis! Using a can of compressed air is a good way to remove all the dust from the fans inside the case. A clean computer will run cooler and more efficiently.